A lovely book full of mouth-watering words and pictures arrived today. 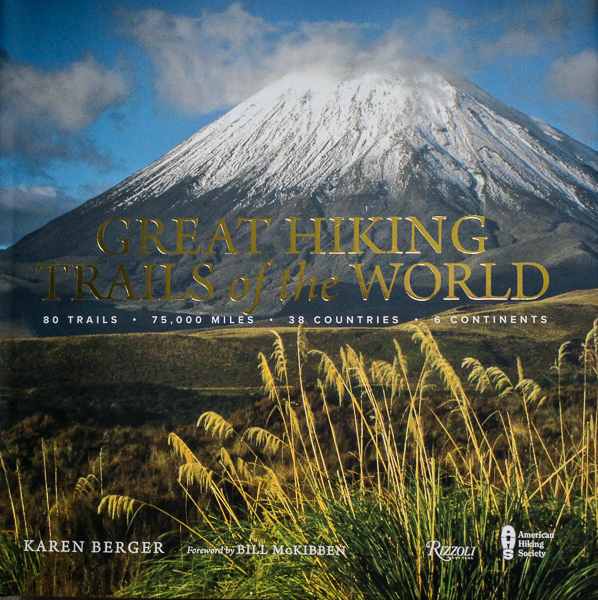 Great Hiking Trails of the World by Karen Berger is a coffee-table book covering 80 trails of varying length and character, everything from the Pacific Crest Trail to the Hadrian's Wall Path, the Kungsleden and the Annapurna Circuit. The author has walked many of these trails herself, some 18,000 miles in total. Others were suggested by fellow walkers. The aim of the book is to inspire and it certainly does that. Flipping through it I've already found half a dozen trails I'd like to do and been enticed to return to ones I've already done. The book is packed with spectacular photographs, a few of them by me. Readers will probably recognise some of the other photographers names too. Many years ago I met Karen Berger at a hiker's gathering in the USA and we spent an enjoyable evening discussing long-distance walking. As a dedicated hiker, lover of the outdoors and experienced writer I can't think of anyone better to write a book like this. Much research has gone into the book too with legends, history, culture and nature all appearing. Anyone who likes walking should find this book a delight. As Karen Berger says in the Introduction it's about "walking, then walking some more". Great Hiking Trails of the World is published by Rizzoli and costs £35.